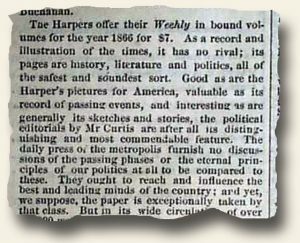 “The Harpers offer their Weekly in bound volumes for the year 1866 for $7. As a record and illustration of the times, it has no rival; its pages are history, literature and politics, all of the safest and soundest sort. Good as are the Harper’s pictures for America, valuable as its record of passing events, and interesting as are generally its sketches and stories…” (view entire article). The link RareNewspapers.com will take you to our website where nearly every Harper’s Weekly has been photographed and described for your reading and viewing pleasure. Please enjoy. An apt review! The exquisite detail of the engravings makes one wonder at the enormous amount of work (and talent) needed to create them! Having obtained many Harper’s, both individual issues and some bound volumes, I cannot recommend them enough for beginning collectors in order to get the feel and flavor of the 19th century. Other fine illustrated publications in the same vein include Gleason’s Pictorial, Ballou’s Pictorial, Frank Leslie’s Illustrated, New York Illustrated News, Southern Illustrated News, Illustrated London News, The Day’s Doings (London), the Daily Graphic, National Police Gazette, Illustrated Police News, and Scientific American. As an added bonus, they occasionally have super-large, fold-out engravings spanning several pages in size. There is a reason Harper’s and these others enjoyed such large circulations at the time. It’s fun–and quite educational–for us to rediscover that reason today.